2: Do Men Date Certain Women to Impress Other Men? Have you ever wanted to know if men date certain women just to impress other men? YES! You better believe they do! Most men aren’t afraid to admit that it’s a huge confidence (and ego) booster to be seen with a beautiful woman on your arm. BUT…you don’t have to take my word for it. 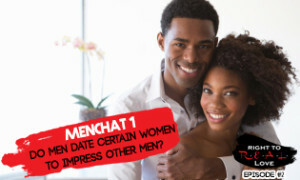 Listen to this episode of MenChat, as three men share with you exactly why men will date an attractive woman just to impress others. If you enjoyed this podcast, click to tweet and share it with others! Episode Title: Do Men Date Certain Women to Impress Other Men? What did you enjoy most about this topic and learn from the answers these men provided?